Very rare video games can be worth a pile of money. (Mental Floss) -- If you've ever collected baseball cards, comic books, stamps, or maybe those limited edition commemorative plates, you understand the concept of the "Holy Grail" item. It's that last, hard-to-find, incredibly rare, usually expensive piece that you have to have before you can officially say your collection is complete. If you're a collector of vintage home video game cartridges (or "carts"), sometimes that can mean paying a pretty penny for the pièce de résistance. Why So Expensive? : Stadium Events was released by Bandai in 1987 as one of the few games available in America that was made for the company's Family Fun Fitness mat, a soft, plastic controller you walked, ran, and jumped on to make the characters move. Nintendo bought the rights to the game and the Fitness mat in 1988 and re-released them as World Class Track Meet and the Power Pad controller. To avoid consumer confusion, Nintendo pulled all copies of Stadium Events from shelves and had them destroyed, but not before approximately 200 carts had already been sold. Of those 200, collectors believe that only 10 to 20 complete copies of the game exist today, making them a real rarity. Stadium Events recently made headlines with two high-profile eBay sales. A North Carolina woman was cleaning out her garage and found an old Nintendo and a handful of games, including Stadium Events. She put them up on eBay without high expectations and was amazed to see the bids steadily climb up to $13,105. While the game itself is valuable, the winning bidder was most interested in the cardboard box it came in. Since most kids threw the box away after tearing open a new game, intact boxes for any game are really hard to come by, but especially so for Stadium Events. Empty Stadium Event boxes have been known to sell for $10,000 alone. After hearing of the success of this eBay seller, a man in Kansas dug up a factory-sealed copy of the game that he thought was worthless. However, his game became only the second known sealed copy in existence. He'd purchased the game in 1987, but could never find the Fitness mat to go with it. It was still sealed because he'd meant to return it. When his eBay auction ended on February 26, 2010, the game sold for an amazing $41,300. The same game repackaged by Nintendo, World Class Track Meet, generally sells for less than $3 on eBay. Why So Expensive? 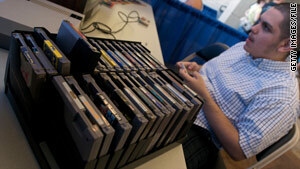 : In 1990, Nintendo held a 30-city gaming tournament to find the best player in the world. Players had to get the best score in demo versions of three games -- Super Mario Bros., Rad Racer, and Tetris -- all within a six-minute time limit. At the end of each city's tournament, the winners of each of three age groups were given special gray Championship cartridges exactly like those used in the competition, which means only 90 of these cartridges were distributed. The gold version was sent out to those who won a promotional contest in the pages of Nintendo Power magazine. Only 26 gold games were produced, so they're especially hard to find and command a higher price today. Why So Expensive? : In the early 1990s, Nintendo held competitions on college campuses and at popular Spring Break destinations. Like the World Championships, players had six minutes to play for high scores on demo versions of Super Mario Bros. 3, PinBot, and Dr. Mario. Most copies of the game were destroyed after the competition ended, but one Nintendo employee kept his cart and sold it to Rob Walters at a garage sale in 2006. This garage sale is legendary among retrogamers, as Rob bought all kinds of NES Holy Grails for only $1,000. By the time he re-sold everything, he'd made 50 times that. Part of that $50,000 was the Campus Challenge cartridge, which went for $14,000. Shortly after, the buyer of the cart turned around and sold it on eBay for $20,100. As far as anyone knows, it's the only copy of the game in the world. Why So Expensive? : It's never mentioned in the same breath as Pac-Man or Donkey Kong, but Atlantis was a pretty popular game in 1982. The gameplay was similar to Missile Command, with players defending their base from overhead attack by enemy ships. The developer held a tournament called Destination Atlantis, where players were invited to send in photos of their TV screens displaying their high scores. The best players were then sent Atlantis II, a special edition of the game that featured faster enemy ships worth fewer points, making it harder to get a high score, but easier to determine the true champions. Because this version was not mass produced, its pretty rare today. But if you find a copy of the original Atlantis at a garage sale, it might be a good idea to pick it up anyway. The competition cart had the exact same colorful label of the regular Atlantis, but had a small, white sticker slapped on the front that read "Atlantis II." The label was easily peeled off, so a quick Google search will show you how to determine if you bought a $3 Atari game or a $6,000 one. Why So Expensive? : Air Raid is a bit of an enigma for Atari fans. Some say it was the one and only game produced by a company called "Menavision" (or perhaps "Menovision"). The game is so shrouded in mystery, it can't even be verified that "Air Raid" is its official title -- there's no name on the label. The name was based on the gameplay, which is similar to Atlantis and Missile Command, and by the picture on the label of a city being attacked by flying saucers, jets, and helicopters. This strange cartridge appeared around 1984 in a bright blue "T-handle" casing that is very different from the standard, square, black Atari carts sold in North America, but is similar in style to those sold in Brazil. Furthermore, while a few second-hand copies have been sold, no one can ever say they were the original owner. The mystery, as well as the fact there are only 12 known copies, make it a must-have for serious Atari collectors. Why So Expensive? : Advertised in Parker Brothers' 1983 retail catalog as Revenge of the Jedi: Game I but affectionately known as Ewok Adventure, the cart became legendary for never being sold. In the game, players took control of an Ewok and flew a hang glider over the forest moon of Endor in an attempt to blow up an Imperial base. You could avoid or kill enemy Stormtroopers, Speeder Bikes, or Imperial AT-ST Walkers, or you could instead commandeer these vehicles to take out the base. The game was shot down by Parker Brothers' marketing department, which felt the controls were too hard to master, so it was never produced. The game's designer, Larry Gelberg, gave the one and only known prototype copy to a friend's son, who later sold it for $1680. Why So Expensive? : One of the main games that all Neo Geo fanatics are looking for is a particular version of Kizuna Encounter, a 1996 fighting game similar to Mortal Kombat or Street Fighter. The game itself has received solid reviews, but isn't groundbreaking by any means. However, it was produced in such small quantities for the European market that collectors speculate fewer than 15 copies were made. The Japanese version, which is exactly the same except for different packaging, is fairly common and sells for about $50. Why So Expensive? : Ultimate 11 was the final game in the Super Sidekicks series, a popular franchise of soccer games that sold very well. For some reason, though, Ultimate 11 was not produced in large quantities, and there are now fewer than 10 known copies in existence. That kind of rarity makes it a must-have for collectors. In late 2009, a private sale was reportedly made between two members of the collectors' forums at neo-geo.com. The buyer paid an astonishing $55,000 to acquire both Kizuna Encounter and Ultimate 11. The original owner purchased the games around 10 years ago, when Kizuna was selling for $500 and Ultimate for $400. The new owner has said he will not sell them, even if he were offered $100,000.